New. Innovative. Exclusive. The Gracious Living Contour Adirondack chair is the classic cottage-look redesigned with comfort in mind. The unique contoured design provides superior comfort. The built-in lumbar support provides maximum support for your pelvis, upper and lower back. The simple yet ingenious design lets you sit comfortably while you relax your back. 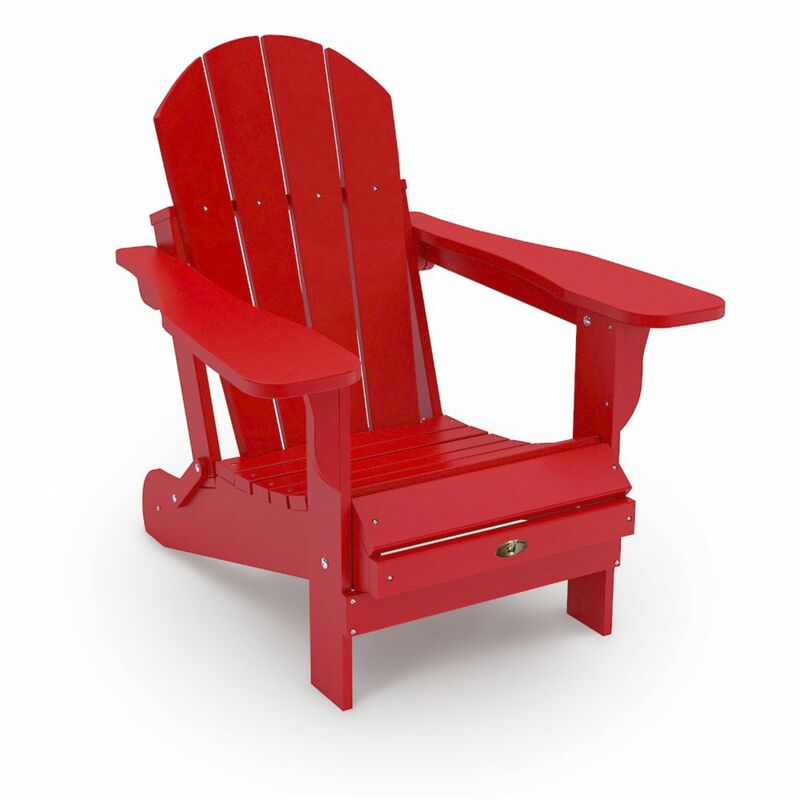 Leisure Line Red Patio Adirondack Chair is rated 4.5 out of 5 by 6. Rated 5 out of 5 by Muskoka life from muskoka chairs Lovely red color Muskoka chairs to celebrate Canada 150! Rated 5 out of 5 by smartalex from Great Chair - Very Satisfied with Purchase I debated between cedar and these recycled plastic chairs. Cedar was out of stock and these were on sale, so I went with them. Once I got them assembled, as I bought two, I was very very happy with the finished product. After I put together one, the second was relatively fast. They come with stainless steel hardware, which was part of the overall quality. There were one piece that did not have pre-drilled holes, otherwise everything comes pre-drilled and ready to screw together. Most pieces are pre-assembled and you just need to attach everything together. They look great in the back yard and I just wipe them clean every now and then. Lastly, the lifetime warranty sealed the deal. Please note that these are solid chairs and not lightweight, they do fold which helps if you need to move or store them. Rated 5 out of 5 by practicalmom from Amazing Customer Service by Leisure Line I read one of the reviews complaining about the crack in the back. I had the same issue on my chairs a couple years ago. So, I contacted Leisure Line. They stood behind their product 100%. Sent me brand new backs (which had been redesigned in light of the cracking problem) at no charge, and I received them within 5 days of contacting Leisure Line. That's right, no charge for the parts, no charge for the shipping. And the new backs are still in perfect shape after sitting outside through two winters. I firmly believe that the way to judge a company and its products isn't just whether there is never an issue with a product, it's how the company deals with a problem. I will be buying more of these chairs to replace our few remaining wood Adirondack chairs. Excellent Product. Excellent Warranty. Excellent Company. Rated 2 out of 5 by westgirl from Not even two years and there are cracks Our two chairs are not two years old and there are cracks in the upper section of the back part. We love these chairs but with the cracks we will not buy another one. Rated 5 out of 5 by vezsenyi from Amazing quality with a 40 year warranty I just want to say these are the best chair for the best price with the best quality. Assembly was simple AND THE FOLD UP FOR STORAGE!! Rated 5 out of 5 by impressedwith from Amazing find The quality of this chair regardless of price is fantastic. The fact that its only $159 blows my mind. I have tried and returned 2 others from different retailers and was very close to purchasing a pair for more than double the price. The quality of these is easily as good if not better than those and how can you beat a 40yr. warranty? I highly recommend this chair. The only thing I would note is I reversed the direction of the top bolt closest to the end of the arm. That way the nut and exposed bolt is not where your hand could easily become scratched on the end. Well worth the purchase price! Will these be available in different colors again this year Looking for grey. Hi. I need 2 of these chairs in Red. When will they be instock again anywhere in Calgary, Alberta?